It is the second installment of the first-ever Bloggers United: An Interactive Shopping Affair, which was held last May. Due to insistent demand from readers and bloggers alike, Bloggers United team in partnership with the country’s largest online shopping website, Multiply Philippines have gathered Manila’s fashion bloggers to sell their pre-loved but very stylish closet pieces! Part of the proceeds from this event will go to the GMA Kapuso Foundation for its school building project, a small but significant step to improve the Filipino youth’s access to education. 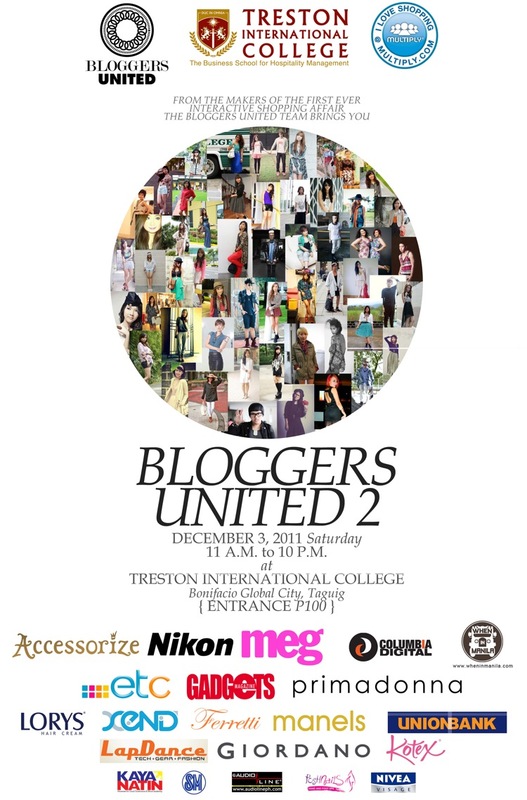 The organizers behind BLOGGERS UNITED BAZAAR (PART 2) are Ana Gonzales, Melai Entuna and Aisa Ipac, a team of blogger friends encouraging camaraderie and sense of “community” among Manila’s (and eventually, the country’s) fashion blogging community through events and productions like this. And I'm so happy I won passes from Ava's (one of my most favorite blogger) BU2 Giveaway. Thanks ava, can't wait to see you and other bloggers there!! !